The Souk is the weekly market. 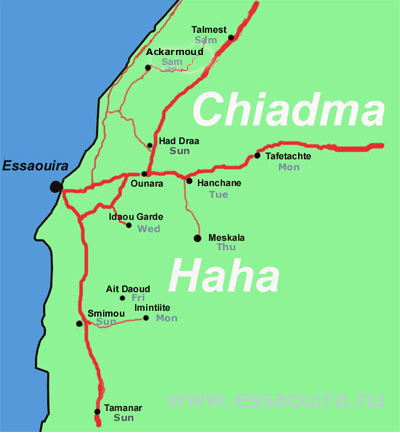 Here are a selection of souks in the nearby villages. 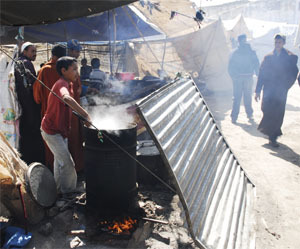 The souk is a marketplace for the neccesities in the region. Locally produced vegetables, olive and argan oil, fruits, cereals, herbs and honey. Living animals like cows, camels, donkeys, sheap, goat, chicken, birds are for sale as well as animalproducts as milk, eggs and meat slaughtered in the morning. If you are looking for anything to buy you find it in the souk. In the medina there are souks of different characters. There are souks for spices, cloths, meat, fish, cereals, jewelery, etc. with a lot of similar shops. The souk is a meetingplace with economical as well as social benefits especially in the rural districts. There is also a local fleemarket in Essaouira on Sundays. 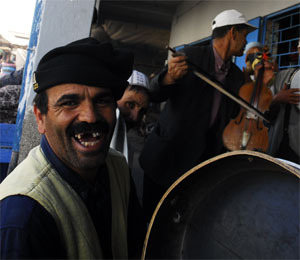 and Haha to the Amazigh (Berber) tribes. The Moroccan currency is the Moroccan Dirham, MAD. The picture of Hassan II, the father of the present king Mohammed VI, and a drawing of the Mosque Hassan II which was completed 1993 and is the largetst mosque in Morocco and the 3rd in the world. Before the introduction of a modern coinage in 1882, Morocco issued copper coins denominated in falus, silver coins denominated in dirham & gold coins denominated in benduqi. From 1882, the dirham became a subdivision of the Moroccan rial, with 10 dirham = 1 rial. The dirham was reintroduced in 1960. It replaced the franc as the major unit of currency but, until 1974, the franc continued to circulate, with 1 dirham = 100 francs. In 1974, the santim replaced the franc. Sometimes you go to the Souk just to look around. Then you can have a bered a tay (a pot of tea) and chat with friends. You buy the tea, Na_Na (mint) and the suger. Hot water and a charcoal fire, zenia (tray), glasses and the bered (teapot) you find in a tent with a carpet on the ground where someone helps you to make the tea! A 4 falus coin (1873). Diameter 28mm. Minted at Fes by Mohammed IV (1802-1873) Sultan of Morocco. The prices is often set in Dirhamns or Euro. For a local the prices could be expressed in different ways. If the price is in Rial you divide with 20 to get the price in Dirhams. So, how much does the house cost if it is 45 million Santimes? Avoid paying excess money to professional hustlers who try to take advantage of you being innocent and without knowledge about the right price. Buying from the local, rural, markets is empowering the local communities. when you leave the country without declaration. When buying food or products from the "Hanouts", small local shops there are fixed prices. Everyone know how much milk and bread costs. Also the cafe´s and restaurangs,buses, local taxis and some other providers have fixed prices. In general you can say that all goods have its right price. It is depending upon supply and demand and the Moroccans are good merchants. They also have eye for your interest in an object or any kind of your needs and don´t hesitate to take advantage of your interest or lack of knowledge. An Eco Friendly Tourists looks for the opportunity to buy from local markets or for the fair price and take their time to study the market and quality of goods before buying. Numbers are written in the European way in Morocco.